Sm-p80, the large subunit of Schistosoma mansoni calpain, is a leading candidate for a schistosomiasis vaccine. The prophylactic and antifecundity efficacy of Sm-p80 has been tested in three animal models (mouse, hamster and baboon) using a multitude of vaccine formulations and approaches. In our continual effort to enhance the vaccine efficacy, in this study, we have utilized the adjuvant, synthetic hexa-acylated lipid A derivative, glucopyranosyl lipid A (GLA) formulated in aluminum (GLA-Alum) with recombinant Sm-p80. The rSm-p80+GLA-Alum immunization regimen provided 33.33%–53.13% reduction in worm burden in the mouse model and 38% worm burden reduction in vaccinated baboons. Robust Sm-p80-specific immunoglobulin (Ig)G, IgG1, IgG2a and IgM responses were observed in all immunized animals. The rSm-p80+GLA-Alum coadministration induced a mix of T-helper (Th) cells (Th1, Th2 and Th17) responses as determined via the release of interleukin (IL)-2, IL-4, IL-18, IL-21, IL-22 and interferon-γ. Schistosomiasis is a neglected tropical parasitic disease affecting over 230 million people worldwide. Current control programs centered on mass drug administration of praziquantel are inadequate. Elimination of schistosomiasis is only attainable through integrated control programs with an effective vaccine serving as a fulcrum. The large subunit of Schistosoma mansoni calcium-activated neutral protease (calpain), Sm-p80, is a leading schistosomiasis vaccine. Sm-p80 vaccine formulated in synthetic hexa-acylated lipid A derivative, glucopyranosyl lipid A (GLA) formulated in aluminum (GLA-Alum) provided significant protection against S. mansoni infections in mice and baboons. GLA adjuvant formulated in Alum did not maximize the immunogenicity and efficacy of Sm-p80 vaccine. Immunizations with Sm-p80+GLA-Alum induced significant production of Sm-p80-specific antibodies (immunoglobulin (Ig)G, IgG1, IgG2a and IgM). Sm-p80-mediated balanced T-helper (Th) cells (Th1/Th2/Th17) immune responses are associated with immune protection in vaccinated animals. The results from this pilot study reinforce the continued development of Sm-p80 as a schistosomiasis vaccine. Due to its inefficiency at overriding the parasite-induced Th2 responses, GLA-Alum adjuvant may not be suitable for the next phase of schistosomiasis vaccine development. Adjuvants are utilized to improve or modulate the intrinsic immunogenicity of an antigen to selectively switch the onset of a specific cell-mediated response in addition to the antibody response.17 18 Based on our previous efficacy studies using Sm-p80 antigen formulated in either glucopyranosyl lipid A in stable, oil-in-water emulsion (GLA-SE)19 or alum hydroxide16 which showed significant protection against S. mansoni infections, we hypothesized that Sm-p80 vaccine formulated with GLA adsorbed on alum hydroxide (GLA-Alum) would enhance its efficacy. GLA and Alum hydroxide adjuvants are currently used in many commercially available vaccine formulations and are potent stimulators of T-helper (Th)1 and Th2 cell immune responses, respectively.20 21 In this present study, we assessed the protective efficacy of Sm-p80+GLA-Alum vaccine against S. mansoni infections in mice as well as in a pilot study using non-human primate model of infection and disease. Mice aged 3–4 week, female C57BL/6, were purchased from Charles River Laboratories International (Wilmington, Massachusetts, USA). Animal husbandry and all performed procedures were guided by the principles of the Institutional Animal Care and Use Committee. Olive baboons (Papio anubis) aged 11–16 years were bred in the Association for Assessment and Accreditation of Laboratory Animal Care and International-accredited facilities at the University of Oklahoma Health Sciences Center (OUHSC). Animals were prescreened for intestinal and blood parasites and for antibodies that are cross-reactive to Sm-p80. Infected Biomphalaria glabrata snails, the intermediate host of S. mansoni, were provided by Schistosomiasis Resource Center (Biomedical Research Institute, Rockville, Maryland, USA). On the day of challenge, infected snails were exposed under light to induce cercarial shedding. The number and viability of cercariae were counted under a light microscope. The recombinant Sm-p80 protein (rSm-p80) was produced using prokaryotic expression system as previously described.10 In brief, the full length Sm-p80 gene cloned into pCold II (GenScript Corp., Piscataway, New Jersey, USA) and transformed into BL21 (DE3) Escherichia coli strain (Invitrogen Corp., Carlsbad, California, USA). The expression of recombinant protein was induced by 0.75 mM isopropyl β-D-1-thiogalactopyranoside. Expressed protein was purified by affinity chromatography followed by size exclusion chromatography. Endotoxin levels in purified protein samples were analyzed with a Limulus amebocyte lysate assay (Charles River Laboratories International) and the quality of rSm-p80 analyzed by sodium dodecyl sulfate polyacrylamide gel (SDS-PAGE) and western blotting. Formulated GLA-Alum was provided by PAI Life Sciences. For the mouse experiment, three independent vaccine trials were conducted with a total of 10 mice per trial, divided randomly into the control group (n=5) and the experimental group (n=5). Each mouse in the control groups was immunized with 5 µg GLA-Alum, while those in the experimental group were immunized with 25 µg rSm-p80 in combination with 5 µg GLA-Alum. Primary immunization followed by two boosters were administered intramuscularly at weeks 0, 4 and 8, respectively. Four weeks after the last immunization of each trial, the mice were challenged with 150 S. mansoni cercariae via tail exposure. For the pilot baboon experiment, six baboons were randomly divided into control (n=3) and experimental (n=3) groups. The control group received 50 µg GLA-Alum, while the experimental group received 250 µg rSm-p80 with 50 µg GLA-Alum at weeks 0, 4 and 8. Four weeks after last immunization, all the baboons were exposed to 1000 S. mansoni cercariae at the deposit site of the axillary cavity. Online Supplementary table 1 shows immunization protocol and the experimental schedule. Peripheral blood mononuclear cells (PBMCs) from the two groups of baboons were isolated by density gradient centrifugation using HISTOPAQUE−1077 (Sigma-Aldrich, St. Louis, Missouri, USA) every 4 weeks. After euthanasia, spleen cells and lymph node cells from baboons were isolated and stored. In the mouse experiment, the spleens were removed from each animal after sacrifice and splenocyte suspensions were prepared for 3-(4,5-dimethylethiazol-2-yl)−2,5-diphenytetrazolium bromide (MTT) assay. A standard MTT assay was performed as follows: in a 96-well flat bottom plate, PBMCs, lymph node cells and splenocytes (5×105/200 µL/well) were stimulated with 0.5 µg of concanavalin (ConA), 1.2 µg of recombinant Sm-p80 or 1.2 µg of ovalbumin (OVA). After 48 hours of incubation at 37°C, 100 µL of supernatant was gathered for cytokine production assay by ELISA. Twenty microlitres of MTT was then added to the remainder during cell proliferation, as described in previous papers.13 15 25–29 Hundred microlitres of dimethyl sulfoxide was then loaded into each well to dissolve the formazan salt crystals. The plate was read at OD 500 nm and SI was calculated as the ratio of OD 550 nm of stimulated cells to non-stimulated cells. Th1/Th2 cytokines (interleukin (IL)-2, IL-4, interferon (IFN)-γ and IL-10) were detected using a murine cytokine Th1/Th2 ELISA panel kit (ebiosciences, San Diego, California, USA) and monkey cytokine ELISA kits (U-cyTech, The Netherlands). These were performed according to the manual provided by the manufacturer. All in vitro experiments were done in triplicates. In a six-well plate, 2×107PBMCs and lymph node cells from baboons and splenocytes from mice and baboons were seeded and maintained in complete Roswell Park Memorial Institute (RPMI) 1640 medium containing 10% fetal bovine serum, 100 µg/mL of penicillin G, 100 µg/mL of streptomycin and 10 µg/mL of gentamicin, with or without 12 µg/mL of recombinant Sm-p80 for 24 hour at 37°C. After 24 hour, the cells were collected and washed with ice-cold phosphate buffered saline. RNA was extracted using the TRIzol method (Invitrogen Corp.). RNA (0.5 µg) was used to synthesize cDNA by reverse transcription. Expression of cytokines (mouse: IL-1α, IL-1β, IL-2, IL-3, IL-4, IL-5, IL-6, IL-7, MIP-2, IL-9, IL-10, IL-11, IL-12α, IL-12β, IL-13, IL-14, IL-15, IL-16, IL-17, IL-18, IL-19, IL-20, IL-21, IL-22, IL-23, tumour necrosis factor (TNF)-α, IFN-γ, transforming growth factor (TGF)-β1 and TGF-β2; baboon: IL-1α, IL-1β, IL-2, IL-4, IL-5, IL-6, IL-8, IL-10, IL-12α, IL-12β, IL-18, IL-21, IL-22, IL-23, TGF-β1, TGF-β2 and IFN-γ and glyceraldehyde 3-phosphate dehydrogenase (GAPDH) were determined via RT-PCR as outlined previously.12 15 16 26 29 The RT-PCR products were analyzed on a 2% agarose gel, and the relative difference was determined using Quantity One (V.4.6.2, Bio-Rad, Hercules, California, USA). All in vitro experiments were done in triplicates. ELISPOT assay was used to spot IL-4, IFN-γ and IL-17 secreting cells stimulated with recombinant Sm-p80 in vitro. Briefly, PBMCs from baboons and splenocytes from mice were seeded (3×105 cells/100 µL/well) on the 96-well precoated (anti-IFN-γ, anti-IL-4, or anti-IL-17, R&D, Minneapolis, Minnesotta, USA; U-cyTech). The cells were stimulated with either 0.5 µg ConA or 5 ng phorbol 12-myristate 13-acetate plus 100 ng ionomycin or 1.2 µg recombinant Sm-p80 or 1.2 µg ovalbumin and incubated at 37°C with 5% CO2 for 48 hours. Spot-forming unit (SFU) representing single cells were counted using an ELISPOT Bioreader 5000 (ImmunoBioSystem, The Colony, Texas, USA). Antigen-specific SFU per well was calculated by subtracting its background value (medium control well without antigen), as described in previous studies.12–14 19 28 All assays were done in triplicates. In a 24-well plate, 2×106 PBMCs from baboons and 4×106 splenocytes from mice were cultured in each well in the presence of 12 µg/mL of recombinant Sm-p80 for 24 hours at 37°C. The cells were maintained solely in normal complete RPMI media as a control. BD GolgiStop Protein Transport Inhibitor was added in the last 10 hours of incubation. Cells maintained in phorbol 12-myristate 13-acetate (100 ng/mL) and ionomycin (1 µg/mL) were processed as positive controls. The splenocyte staining procedure was performed following the instructions provided by the Mouse Th1/Th2/Th17 Phenotype Kit (BD Biosciences, San Diego, California, USA). Following two washes with staining buffer, the cells were fixed and permeabilized with cold BD Cytofix buffer and BD Perm/Wash buffer. Twenty microlitres of cocktail antibody (antimouse CD4Peridinin Chlorophyll Protein Complex (PERCP)-CY5.5, antimouse IL-17A phycoerythrin (PE), antimouse IFN-γ flourescein isothiocyanate (FITC) and antimouse IL-4allophycocyanin (APC) was added to each tube and incubated for 30 min at room temperature. For baboon PBMCs, PerCP-Cy5.5–conjugated mouse antihuman CD4 was used to identify CD4+ T cells. The addition of APC-mouse antihuman IL-4, PE-mouse antihuman IFN-γ and FITC-mouse antihuman IL-17 were then added for intracellular staining to detect IFN-γ, IL-4 and IL-17 secreting cells. All immunological reagents and antibodies were purchased from BD Biosciences (San Diego, California, USA). Data were collected using CellQuset Prosoftware (BD Biosciences) and analyzed via FlowJo software (Tree Star, Ashland, Oregon, USA). Significance between the control and experimental groups was calculated via the independent two-sample t-test or the Mann-Whitney-Wilcoxon rank-sum test, using Sigma Plot (V.11.0, Systat Software). Bonferroni adjustments were included for multiple comparisons to reduce the risk of reaching false conclusions based on chance. P<0.05 was considered significant. The protective efficacy of Sm-p80+GLA-Alum was evaluated in both baboon and three independent mouse trials as described above. In mouse trial 1, the mean worm recovered from the GLA-Alum control group (27±3.54) compared with the group immunized with Sm-p80+GLA-Alum (18±0.84) revealed a 33.33% significant reduction in worm burden (p=0.045) (online Supplementary table 2). In mouse trial 2, we also observed a statistically significant reduction (53.13%, p=0.0048) in worm burden when the average worm numbers was compared between the control group (32±3.12) and the experimental group (15±2.89 worms). We also observed a 44% reduction in worm burden in mouse trial 3 (p=0.075) (online Supplementary table 2). Overall, we observed a slight significant reduction in tissue egg load in all mouse trials except for the intestinal egg burden in trial 3 (75.52% egg reduction, p=0.032) (online Supplementary table 2). The overall cumulative parasitological data for all three independent mouse trials are shown in table 1 and online Supplementary figure 1B. For the pilot baboon trial, we observed a significant reduction (38.53%) in worm burden when the average worm numbers of the GLA-Alum control group (646.33±17.34) was compared with that of the Sm-p80+GLA-Alum immunized group (397.33±40.05 worms) (table 2 and online Supplementary figure 1A). We observed a 37.95% reduction in intestinal egg load in baboons immunized with Sm-p80+GLA-Alum when compared with the controls. However, there was no difference in hepatic egg burden between both groups (table 2). Statistically, no vaccine-mediated preferential killing of either male or female worm was observed. Specifically, the recovery of male and female worms cumulatively was as follows: control group ((mice) 65.94% male, 34.05% female), vaccine group ((mice) 59.74% male, 40.25% female), control group ((baboon) 47.33% male, 52.67% female), vaccine group ((baboon) 48.9% male, 51.1% female). Titres of anti-Sm-p80 antibodies in immunized mice and baboons. ELISAs were performed with sera obtained from each mouse (2-week intervals) and baboon (4-week intervals) in their respective control and experimental groups. Peak antibody titres for total immunoglobulin (Ig)G, IgG1, IgG2a, IgG2b, IgG3, IgM and IgA in (A) the control and vaccinated mice and (B) the control and vaccinated baboon groups. No signals were detected for IgG4 in either the glucopyranosyl lipid A (GLA) formulated in aluminum (GLA-Alum) control or the rSm-p80+GLA-Alum experimental baboons. Values represent the mean of the three experiments±SD. Mouse sera from each group were pooled for ELISA. The titres for the total IgG and subtypes were analyzed based on specific time points. In the experimental group, the titres of Sm-p80-specific antibodies were detected starting at week 2 and reached a peak at week 6, week 8 or week 10. Among the specific antibodies, the total IgG and IgG2a remained the highest at 1:204 800 and 1:12 800 from week 10 and week 12, respectively, and their peaks were delayed 2 weeks in comparison to IgG1, IgG2b and IgA. IgG1, IgG2b and IgA reached peaks of 1:6400 at week 8 through week 12. However, IgG3 failed to exhibit an increase from week 2 onward. IgM started to decrease at week 12 after the peak level of 1:3200 from week 6 to week 10. The peak levels of rSm-p80-specific antibodies in the murine model experiment are shown in figure 1A. In baboons from the experimental group, the total IgG and its subtypes reached a peak of 1:12 800–1:25 600 (IgG), 1:800–1:6400 (IgG1), 1:100–1:400 (IgG2) and 1:200 (IgG3) at week 12; IgM and IgA were at their highest between 1:800–1:3200 and 1:1600–1:3200 at week 8, respectively. Figure 1B shows the peak levels of Sm-p80-specific antibodies from individual baboons following vaccination. Specific antigen-induced cell proliferation was tested in vitro. In both experiments, stimulation indices (SI) in ConA-stimulated cells were higher than those stimulated by rSm-p80 or OVA (data not shown). Additionally, when comparing the SI from the baboon experimental group (splenocytes: 1.49±0.07; PBMC: 1.59±0.07; lymph node cells: 1.16±0.04) with the SI of the control group (splenocytes: 1.25±0.06; PBMC: 1.22±0.06; lymph node cells: 0.96±0.04), cells in the experimental group were more sensitive to rSm-p80 stimulation. After 48 hours incubation with OVA, there were no differences found between the control and experimental groups (data not shown). 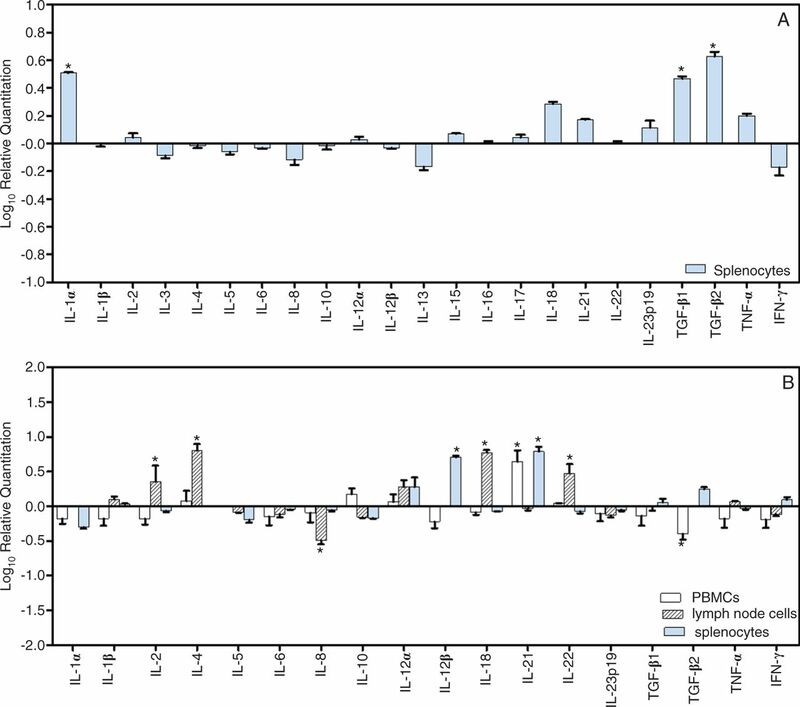 In the mouse experiment, SI of Sm-p80-stimulated splenocytes between control and experimental groups showed a slight difference, but lacked significance (control: 1.49±0.33, experimental: 1.73±0.77). The data from cytokine productions in vitro showed a large amount of IFN-γ released from all three cell types in experimental groups of baboon experiment and splenocytes in experimental groups of mouse experiment after Sm-p80 restimulation (table 3). In addition to IFN-γ, IL-2 was increasingly synthesized in Sm-p80 specific antigen-triggered cells from experimental groups of mouse and baboon studies. In contrast to IFN-γ and IL-2, the production of IL-4 was only increased in mouse splenocytes subsequent to Sm-p80 stimulation, and the increase of IL-10 secretion was only shown in Sm-p80-stimulated splenocytes in experimental groups of mouse and baboon experiments (table 3). RNA was extracted from PBMCs, lymph node cells and splenocytes from baboons and from splenocytes of mice following incubation with rSm-p80. mRNA expression of 23 cytokines in the mice and of 18 cytokines in baboons was estimated via RT-PCR. The profiles of mRNA expression are summarized in figure 2A,B. In the mouse experimental group, following 24 hours of rSm-p80 stimulation, major variations only occurred in inflammatory cytokines (IL-1α and IL-18) and the TGF family. Others showed no significant changes. In the baboon experimental group, upregulation of IL-21 was observed in PBMCs. Some Th1 (IL-2 and IL-18), Th2 (IL-4) and Th17 (IL-22 or IL-21) cytokines were modulated by a specific rSm-p80 antigen in lymph node cells and splenocytes. Relative fold changes of cytokine mRNA expression in vaccinated mice and baboons. After 24 hours incubation with rSm-p80, RNA was extracted from stimulated pooled peripheral blood mononuclear cells (PBMCs), lymph node cells and splenocytes attained from baboons and from stimulated pooled splenocytes isolated from mice. After standardization using glyceraldehyde 3-phosphate dehydrogenase (GAPDH) through Quantity One Programme software V.4.6.2, the relative ratio of cytokine mRNA expression was compared between the control and experimental group. Panel A showed the expression of 23 cytokines in vaccinated mice and panel B showed the relative expression of 18 cytokines in vaccinated baboons. In the mouse experiment, a mean of 15.5 IFN-γ SFU per million splenocytes was detected in the control group and 30 SFU per million formed in the experimental group. This showed an approximate twofold increase between the control and experimental group. The number of IL-4 SFU per million showed a 6.2-fold increase in the experimental group compared with the control group. For IL-17, 41 SFU per million were observed in control group and 91 SFU per million were observed in experimental group, exhibiting a 2.2-fold increase compared with the control group (figure 3A). In the baboon experiment, the mean of the control group was 165 IFN-γ secreting SFUs per million PBMCs and 967 IFN-γ secreting SFUs per million PBMCs in the experimental group. This indicated more than a 5.9-fold increase in IFN-γ secreting SFU per million in rSm-p80 formulated in GLA-Alum vaccinated animals when compared with their respective control group (adjuvant alone). Although the difference was seen in IFN-γ secreting SFU per million in PBMCs, there was no significance related to IL-4 and IL-17 secreting PBMCs in either the control or the experimental group (figure 3B). Detection of Th1/Th2/Th17 secreting cells in splenocytes of mice (A) and peripheral blood mononuclear cells (PBMCs) of baboons (B). Interferon (IFN)-γ, interleukin (IL)-4 and IL-17 are typical cytokine markers for Th1/Th2/Th17 subsets. IFN-γ, IL-4 and IL-17 secreting cells were assayed by Enzyme-Linked ImmunoSpot. Spot-forming units (SFUs) were calculated in one million cells. The SFUs for cells obtained from the control group (glucopyranosyl lipid A (GLA) formulated in aluminum (GLA-Alum)) are shown as blue bars, and green bars represent rSm-p80 stimulated cells from the experimental group (Sm-p80+GLA-Alum). Flow cytometry was performed to determine the roles of Th1, Th2 and Th17 responses in Sm-p80-mediated protection. Comparison of both control and experimental mouse groups showed no significant difference between the percentages of IFN-γ and IL-17 secreting splenocytes (figure 4A). However, the percentage of IL-4 secreting splenocytes in the experimental group had a 2.4-fold increase in comparison to the control group. Similarly, the percentages of IFN-γ and IL-17 secreting PBMCs in the baboon experiment did not exhibit a noticeable difference between the control and experimental group. However, the percentage of IL-4 secreting PBMCs in the experimental group was reduced by 7% in comparison to the control group (figure 4B). Quantification of intracellular interferon (IFN)-γ, interleukin (IL)-4 and IL-17 secretory CD3+CD4+T cells from rSm-p80 stimulated splenocytes from the mouse experiment and peripheral blood mononuclear cells from the baboon experiment. Initial gating was performed using the CD4 marker. The percentage of IFN-γ, IL-4 and IL-17 secretory CD3+CD4+T cells in glucopyranosyl lipid A (GLA) formulated in aluminum (GLA-Alum) and rSm-p80 formulated in GLA-Alum vaccinated groups were shown in mice (panel A) and baboons (panel B). High antibody production plays a significant role in immune protection against schistosomiasis.27 29 36–38 For instance, studies utilizing natural host of schistosomes (rhesus macaques) and/or semi-permissive hosts (outbred rats) have shown that resistance to schistosome infections are almost entirely antibody mediated.38–40 Immunizations with Sm-p80+GLA-Alum induced robust production of Sm-p80-specific total IgG and IgG subtypes (IgG1, IgG2, IgG2 and IgG3) in both mice and baboons in addition to significant IgA and IgM production in vaccinated baboons. In summary, the data presented in this current study demonstrated that Sm-p80 vaccine formulated in GLA-Alum offered a moderate but significant protection against S. mansoni infections in both mice and baboons. However, our findings show that despite the diverse immune responses induced by Sm-p80+GLA-Alum formulation, we submit that GLA-Alum is insufficient in maximizing the immunogenicity of the Sm-p80 antigen. Therefore, GLA-Alum may not be suitable for the next of our Sm-p80 vaccine development. We thank Dr Steve Reed for providing GLA-Alum adjuvant for these studies. We would also like to thank Whitni Redman for critically reviewing the manuscript.
. Characterization of cDNA clones encoding a novel calcium-activated neutral proteinase from Schistosoma mansoni. J Biol Chem 1991;266:15085–90.
. Schistosomiasis mansoni in baboons. The effect of surgical transfer of adult Schistosoma mansoni upon subsequent challenge infection. Am J Trop Med Hyg 1972;21:951–8.
. Schistosomiasis. Curr Protoc Immunol 2013:103. WZ and GA contributed equally. Contributors WZ, GA, WT, AJM, LL and AJS performed the experiments. WZ, AJM, WT, EK and SL wrote the manuscript and performed the statistical analysis. AAS designed the experimental plan. Funding This work was supported in part by grants from the Bill and Melinda Gates Foundation grant (OPP1097535) and from the NIAID/NIH SBIR (R43/R44 AI103983). The snails were supplied through a NIH-NIAID contract (HHSN2722010000051) to Biomedical Research Institute. Ethics approval Institutional Animal Care and Use Committee.